Fridge Filterz FFGE-391-1 cyst filter (Standard 42 & 53) 1 Pack replacement water filter is designed to fit selected GE* & Hotpoint* refrigerators. This premium water filter is designed to remove fine sediment, Chlorine Taste and Odour as well as contaminants and heavy metals including Lead, Mercury, Lindane, 2-4-D, atrazine and benzene, to name a few, that may be present in your drinking water. This refrigerator filter replaces: GE* MWF, MWFA, GWF, GWF01, GWF06, GWFA, Hotpoint HWF, HWFA. The FFGE-391-1 is tested to meet NSF/ANSI Standard 42 & 53, Particulate Class I, to ensure that you are getting a SAFE, quality product. 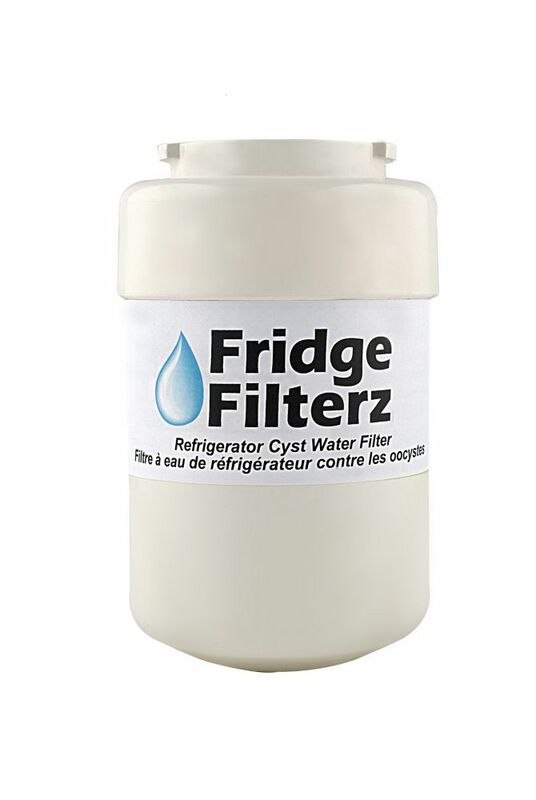 Fridge Filterz are manufactured to the highest quality standard, providing you and your family with clean, odour free ice and water without removing beneficial minerals and fluoride that may be present in your drinking water. All of our fridge filters are made with environmentally friendly (green) carbon. *GE is a registered trademark of General Electric Company. Can't get enough of Arda's products? Add to your Arda range hood with these replacement grease filters specifically crafted for the HAE52T model. An important addition to any cooking space, you'll notice the difference in your kitchen's air quality immediately! For use with Broan and NuTone under cabinet range hoods. These charcoal filters are made from the highest quality materials to provide the longest life possible and keep your range hood operating at peak performance. MWF/MWFP Replacement Water & Ice Filter for GE Refrigerator Fridge Filterz FFGE-391-1 cyst filter (Standard 42 & 53) 1 Pack replacement water filter is designed to fit selected GE* & Hotpoint* refrigerators. This premium water filter is designed to remove fine sediment, Chlorine Taste and Odour as well as contaminants and heavy metals including Lead, Mercury, Lindane, 2-4-D, atrazine and benzene, to name a few, that may be present in your drinking water. This refrigerator filter replaces: GE* MWF, MWFA, GWF, GWF01, GWF06, GWFA, Hotpoint HWF, HWFA. The FFGE-391-1 is tested to meet NSF/ANSI Standard 42 & 53, Particulate Class I, to ensure that you are getting a SAFE, quality product. Fridge Filterz are manufactured to the highest quality standard, providing you and your family with clean, odour free ice and water without removing beneficial minerals and fluoride that may be present in your drinking water. All of our fridge filters are made with environmentally friendly (green) carbon. *GE is a registered trademark of General Electric Company. MWF/MWFP Replacement Water & Ice Filter for GE Refrigerator is rated 1.7 out of 5 by 3. Rated 3 out of 5 by Me not u from Slow flow The filter I usually purchase was not available so I selected this one thinking there would be little or no difference. I was wrong, this one flows at a much lower volume that the others do. It takes so long to fill up a cup of water that I have to book the afternoon off from work to fill up a pot. Rated 1 out of 5 by Windsor Mom from Not the same as GE Brand Bought water filter from home depot as I was unable to find GE brand sold in Canada. I was very disappointed with the taste in the water and will continue to locate a GR brand filter sold in Canada. Rated 1 out of 5 by Bill from Exactly as ordered Water filter works well , I liked the fact shipping included in price.